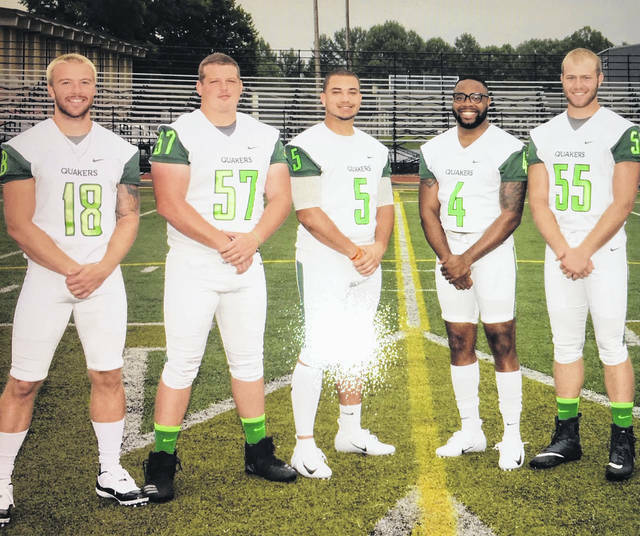 Wilmington College honored its five football seniors Saturday, Nov. 10, 2018 prior to the game against Otterbein. (l-r); Zach Zurface, Saul Boysel, Malik Pettiford, Gino Hinton and Kyle Ackley. WILMINGTON — The 2018 regular season came to a bitter end for the Wilmington College football team Saturday, as the Quakers fell to visiting Otterbein, 34-24, at Williams Stadium. Wilmington ends the season at 1-9 (winless in the Ohio Athletic Conference), while Otterbein closes out the year at 2-8 overall. The game was actually a tale of two halves, with the Quakers getting off to a fast, first-quarter start, before the offense seemed to go away in the second half, and the visitors countered with 21 unanswered points to claim the victory. Wilmington electrified the crowd with a 75 yard kickoff return to open the contest, and reached the end zone when DJ Chambers capped the drive from a yard out. Tyler Butcher’s PAT gave the locals a 7-0 lead. Otterbein answered with a touchdown, the first of four by running back Dakota Smith, but a botched snap on the extra point enabled WC to hold the lead at 7-6. Chambers got his second touchdown of the contest, on an 87 yard run on the next drive, with Butcher’s PAT giving WC a 14-6 advantage. Yet another big play, this one a 65 yard punt return by Luke Richardson, with Butcher’s PAT boot tacked on, gave the Quakers a 21-6 first quarter lead. Cardinals’ quarterback Bryce Hall added a 2-yard score and David Hoyle’s PAT cut the margin to 21-13 with 10:00 remaining in the opening half. The teams battled for field position the balance of the half, and Wilmington was driving late in the quarter when Kyle Barrett’s pass into the end zone was intercepted, negating a potential Quakers score, thus ending the first half. Wilmington added a 33-yard field goal by Butcher five minutes into the third quarter, but those proved the be the final points on this afternoon, and Otterbein started their comeback. By the end of the third quarter, the Cardinals managed a pair of touchdown drives, to forge ahead, 27-24. Smith added his fourth touchdown of the contest, a 32-yard scamper in the fourth quarter, which extended the Cardinals’ lead to the 10 point margin, 34-24. The Quakers could not contain the Cardinal rushing attack, led by Smith who accumulated 203 net yards on 39 carries (and four touchdowns). Otterbein had 392 yards total offense, including 233 yards rushing on 53 attempts. Wilmington could not sustain a strong running game, being held to 165 yards on 25 carries. Wilmington managed a total of 292 yards in total offense. Barrett completed 18 of 35 pass attempts for 127 yards. Itika Wynn Jr. had six catches for 67 yards. Richardson had a pair of receptions for 10 yards. On the defensive side of the ball, top performer for the Quakers was Tre Quez Parks with 13 tackles and Parris Weathersby had an interception. Prior to the kickoff, five graduating seniors, Gino Hinton, Malik Pettiford, Zach Zurface, Kyle Ackley and Saul Boysel, were recognized by the coaching staff. WC-Chambers, 1-yd. run. Butcher PAT good at 14:14. Ott-Smith, 10-yd. run, PAT kick failed at 8:41. WC-Chambers, 87-yd. run, Butcher PAT kick good at 1:57. WC-Richardson, 65-yard punt return touchdown. Butcher PAT kick good at 0:04. Ott-Hall, 2-yd. run. Hoyle PAT kick good at 10:03. WC-Butcher, 33-yd. field goal good at 10:47. Ott-Smith, 1-yd. run. Hoyle PAT kick good at 6:30. Ott-Smith-9-yd. run. Hoyle PAT kick good at 0:44. Ott-Smith, 32-yard run. Hoyle PAT kick good at 10:37.